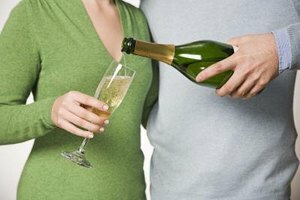 Ring in the new year with your spouse and other couples. 3 What Do You Get a Couple Who Has Been Married 40 Years? Staying in with your spouse on New Year's doesn't have to mean sitting on the couch in your pajamas watching the ball drop on TV. If you aren't in the mood to fight the crowds to attend a New Year's Eve bash, throw your own party at home. Invite other couples and plan a variety of entertaining games that will have everyone laughing their way into the new year. Plan New Year's-themed trivia games related to couples. One idea is to separate each couple and have each partner answer questions based on things they did together in the past year. For example, you might ask questions like how many times did they travel out of town together and what was the funniest thing that happen to them. The partners then come back together to reveal their answers. The couple that has the most answers the same wins. Another idea is to quiz couples on celebrity couples who dated, were married, broke up or had a baby in the past year. The couple that raises a hand first and answers correctly gets a point. Play the white elephant gift exchange. Each couple must bring a wrapped gag gift to the party. Couples take turns picking a gift and opening it. Each couple can choose from the pile or steal another couple's gift. If a gift is stolen from a couple, they can choose another from the pile or steal from another couple. Couples cannot steal a gift back from the same couple that took their gift; once a gift is stolen three times, it can no longer be stolen. For another gift game, wrap a small gift in a small box, and then place it in multiple boxes, each larger than the other. Gather everyone in a circle; don't let partners sit next to each other. When the game starts, each person has 10 seconds to try to open the gift with oven mitts on. Whoever is able to get to the actual gift during his or her turn gets to keep it. Play a couples version of charades, with each couple playing as a team. Come up with a list of relationship-themed words and phrases that each "actor" has to get his or her partner to guess using gestures only. Ideas include "wedding," "date night" and "put the toilet seat down." The team with the most points at the end of the game wins. You could also play a version where the actor draws the phrase that the partner has to guess. To play a verbal challenge game, write words or phrases related to marriage or the new year on index cards, and then write three or four related words underneath each one. The person whose turn it is must get his or her partner to guess the first word without using the related words on the card. No gestures are allowed. Make sure someone is watching to ensure that no forbidden words are used; if they are, the team must forfeit a point. Play a questions game. Write down a bunch of questions related to marriage and the new year. The couples take turns picking the questions out of a hat and asking them of each other. For instance, include questions such as "What do you think your partner is looking forward to the most in the new year?" or "Do you think your partner will keep his New Year's resolution and why or why not?" Another idea is to create fill-in-the-blank cards related to the new year for each guest to fill in. These could include sentences such as "In the new year I will no longer _, and my biggest goal is to ___." No one should write their name on their card. Collect the cards, and then read each aloud one a time, while the rest of the party-goers try to guess who wrote each card.